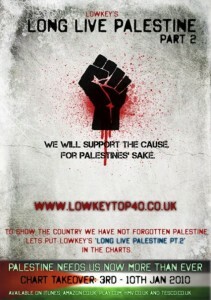 UK top 40, Lowkey’s Long Live Palestine part 2 did not make it. So, many thanks to all who purchased this track, sadly it has not made the charts. At the end of the day, despite not making the charts, we did a good thing, I hope that a lot of money has been raised for Palestine. The facebook group has changed it’s name to “LOWKEY’S CHARITY SINGLE FOR PALESTINE – HERE’S TO WEEK 2” which suggests this may be attempted for a second week running. I do wonder though why it hasn’t hit the charts, not even the RnB singles charts. Whether it was disqualified because of multiple purchases, or just refusal because it’s too political or another reason altogether. It may just be that we didn’t have enough people buying it. There are rumours flying around that the BBC refused to play the song, unconfirmed as of yet. Once we get sales figures, we’ll be able to deduce a more accurate answer. Till then, good work everyone.